Off and running! After weeks of dreaming about it, it only took a few more days of planning, htmling, designing, phone calling, writing and editing, but we have our Rainbow Around the Block quilting effort ready for you to join us! And my favorite part now is the quilt block sewing! 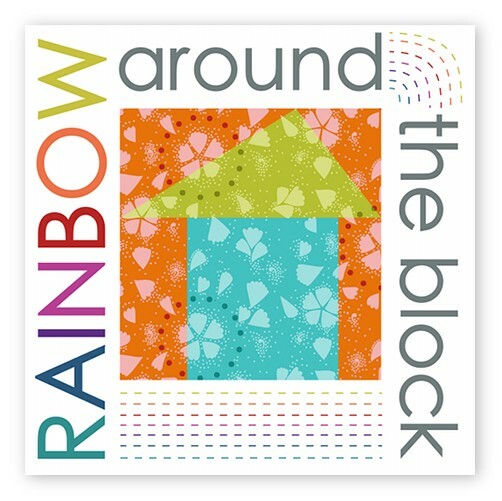 In case you're not up to speed with the giddy-jabber-along, Rainbow Around the Block is a project that I dreamed up to have quilts made for as many families as possible who lost their homes and belongings during the flooding that happened here in May. I recounted my personal experience of those first days of flooding here. As more days passed, I felt compelled, like so many, to find a way to help. Our schools were canceled for a week due to roads and school buildings being too damaged and so rather than have some time to get out on the front lines of cleanup, I was mostly taking care of my brood. Just giving monetarily feels insufficient somehow when the devastation is quite actually in my backyard. While many have the means, the insurance or FEMA to help them rebuild a home or buy necessities, there was so much lost that can't be recovered. Items of great sentimental value washed away. That's so much harder to ever get back again. I decided that I'm not alone. I know there are so many of you that are just exactly like me who have a little time, a little material, and a little know-how to make a small block of something beautiful. And if we put our pieces together we can rebuild a little bit of what was lost. The hopes and prayers that we stitch into these little blocks can help to restore some of those memories, sentiments, and warmth that drowned in the unbelievable rains those two days. Money can only replace money. But giving of our time and talents will replace much! I will be so honored if you help me! All the knitty gritty details of the project are located here at my website and we have all summer to sew. You were going to do that anyway, right? (Not to mention there are ways to help even if you don't quilt.) From that webpage you can link to the Flickr group that we have set up, already sporting members and some pretty blocks too! This is a 200x200 icon that you can post in your sidebar if you choose, and link to either the webpage or the Flickr pool. We also have all the info written up in a simple one page pdf that you can print out, take to your quilting groups, local quilt shops, etc. And thank you, so, so, so much from the bottom of my heart for doing so! I think it's so awesome that you're doing this and even more awesome that the kids are getting involved, too! God bless you! Anna Maria, Thanks for doing this. I'm in and I think I will do the same with my kids tonight as you did with yours. It's on my blog at www.beanieg.blogspot.com (facebooked and tweeted too). Hopefully you'll get lots o' blox. Yay, I'm so thrilled you started this! I'm looking forward to contributing to this wonderful project! I'm in; maybe I can even come to Nashville sometime to help sew them togethert! Hi Anna Maria! I'm in, and I hope to get my friend who is buying a quilt shop involved as well. Just want to be sure. . . any quilt shop quality fabric is welcome, right? I haven't found a local source for yours yet, but I'm still looking. In the meantime, I have some fabric I think would work well. . . . This is a wonderful idea. I will get out my sewing machine and some fabric and try my hand at some blocks. Should be fun!! how wonderful! i'm not a quilter, but i am a sort of sewing generalist, so i'm hoping with the help of a quilting friend i might be able to participate! i love this, and i really want to help, but am pretty new to quilting. 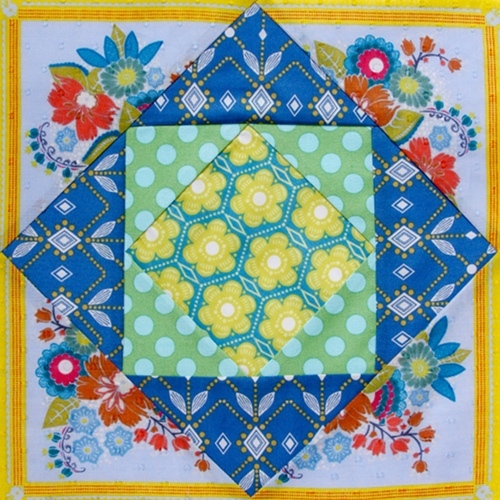 could you direct me to pictures of quilt blocks that you have in mind? Thank you again for organizing, Anna Maria! Great chatting about this project with you at market. I know that our CityCrafters will be totally on board. I'm going to share this info with the members of the Dallas Modern Quilt Guild, too. CityCraft Modern Fabric Boutique will also volunteer to be a Rainbow Around the Block drop-off point for anyone in the North Texas area, and give any customer that donates a block 10% off their entire purchase in store the day of drop-off. I really love this idea of making something to help those who lost everything! I have always wanted to contribute to a charitable quilting event, and this seems like a good push. I love the square-in-a-square examples you gave us. And I love that button representing this effort. Kudos to your brood for putting this together! Bravo to CityCraft for going above and beyond what was asked! If I didn't live 800+ miles away I would love to support your shop! And of course, thank you Anna Maria for doing this. I'm not a quilter, but I'm going to give it my best shot! This looks like a fun project. I love your quilt blocks. Creating blocks is the best part of quilt making. As soon as I finish my 4 projects that I've got going, I'll pitch in to help. P.S. I love the blocks made by one blog follower who hung hers on a line with the sunrays peaking through them. What a great idea! And one quilt block won't cost much in international postage, right? I found you on Sharon Boggan's blog Pin Tangle, and came over to visit. I have been reading your post about the floods in May, and had a look at the photos of the city. We heard a bit about it over here in Australia, but as usual it's your five minutes of fame, then the news goes on to something else. In the meantime your citizens continue to suffer loss of life and property, as we did here during the bushfires last year. My heart goes out to you all; I'm glad to hear you weren't as badly affected, but it is sad to read of so many others who were not as fortunate. You are doing a wonderful job with your quilt project. Many quilters around the world did a similar effort for our bushfire victims. And I love those blocks! Off to read the various links / flickr group. i would be honored to be a part of this. 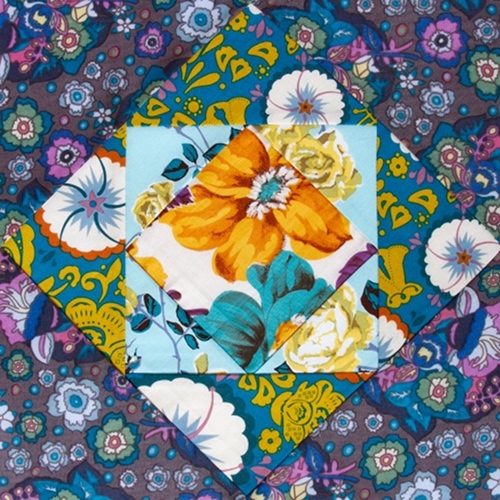 I live in Franklin, TN and have seen it all myself and have plenty of fabric to create some blocks. Time is sparse, but i will donate all that i have. Plus, when the time is right, i would be happy to help with the final piecing and quilting if you would like some help. I remember feeling the same way after the first couple of weeks. I kept finding myself over at Cottonwood Estates - one of the hardest hit areas in my neighborhood - dropping off whatever supplies they needed. At the time it was simple things like ice, gatorade, hand sanitizer - for everyone that was working. But i went home to my house that was fine, after leaving these people with homes that were gutted to the studs. I just knew I could do more. I'm in! What a wonderful way to feel connected with the world. Thank you Anna for organizing this! I'll be bringing your handout to everyone in my quilting class tomorrow night. Thanks for giving us a way to contribute. Hi Anna - I have put a post on my blog asking for more assistance in this effort. Thanks for doing this with your beautiful family! Wondering if you mentioned this at Quilt Market? I can think of several fabulous shops near me, but don't want to hit them on the head with something they may already know about? All the best~We're looking forward to helping out! I just finished my first two blocks for your project, hoping to get more finished soon! I will take my finished blocks to CityCraft when I have a good many to send. Thanks CityCraft for volunteering to help!. Since I am in Allen, TX, this is really convenient! AnnaMaria this is a wonderfull idea! Hi everyone thanks! We will be sending out a targeted email to several of our shop friends so that they can contribute if they are willing and able. I am so inspired! I will definitely be joining the effort. Thanks so much for tugging my heartstrings on the issue. What a wonderful idea! How kind and thoughtful you are! I adore your blocks, they really rock!!! You have such a big heart! 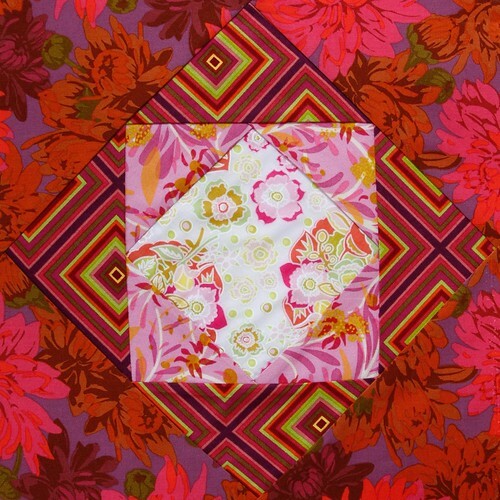 I'm in to help and I'm bringing your pdf to our local Modern Quilt Guild meeting tonight, so hopefully I can drum up some more help! Thanks again for organizing this amazing effort. oh! wonderful! Thank you for sharing! XENPAK-LH80-SM1550 (XENPAK Transceiver) replacement for H3C 10GBase-ER 1550nm 80KM SM XENPAK transceiver is a hot pluggable in the Z-direction module that is usable in typical router line card applications, Storage, IP network and LAN and compliant to XENPAK MSA. XENPAK-LH80-SM1550 (XENPAK Transceiver) is high performance, cost effective module supporting 80KM transmission distance, also, the XENPAK-LH80-SM1550 (XENPAK Transceiver) is a fully integrated 10.3Gbit/s optical transceiver module that consists of a 10.3Gbit/s optical transmitter and receiver, XAUI interface, Mux and Demux with clock and data recovery(CDR). This XENPAK-LH80-SM1550 (XENPAK Transceiver) version of XENPAK transceiver line uses a Cooled 1550nm EML to achieve80KM over standard single mode fiber as 10GBASE-ZR of the IEEE 802.3ae.OurFiber.com is the website of Mingon Technology Co, Ltd. and we are the professional fiber transceiver manufacture which product the SFP transceiver like j4858c,agm731f,3CSFP91,MGBSX1,DEM 311GT, AT SPSX, j4859C are 1000base transceiver. And SFP plus like SFP 10G SR, SFP 10G LR, X2 10GB SR, X2 10GB LR, XENPAK 10GB SR and etc, our products are hot sale items and have excellent quality which have already passed the CE, ROHS and other certifications after we did a series of improvements! I really like the pattern that you show in this post - it's got such a nice design!